At the suggestion of a RepRap website fan I have put together a wiki page showing key items made (almost all by the tireless Vik) as the project has progressed. Honey! I replicated the cat! No, not a Catfab 4000, but a humble Darwin taking shape in New Zealand as it is at time of posting - and, of course the ginger cream Burmese 'Chad', who is kindly demonstrating what I have to put up with in my workshop. 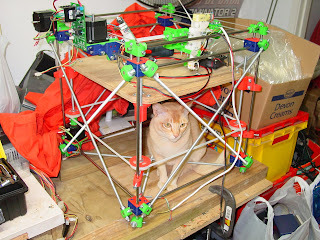 Thought some readers of the blog might like to know I'm now employed by Catalyst IT, stauch supporters of Open Source in New Zealand, who have kindly made it possible for me to work one day a week on RepRap. 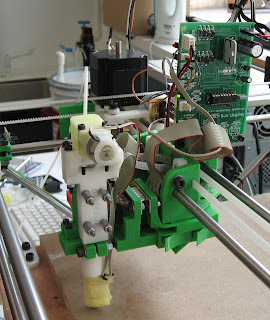 We (and especially Zach) have been devoting quite a bit of thought to how to get people started with RepRaps - when a lot of people have them, then they can all make parts for each other, but when hardly anyone has them then they can't. Note the use of a few silver steel rods as cores for deep through-holes in the parts to be made. 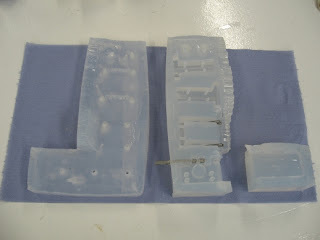 The neat thing about this process is that, while you need a vacuum chamber to make the original mould, the making of the actual parts can be done in ordinary (well ventilated...) conditions. 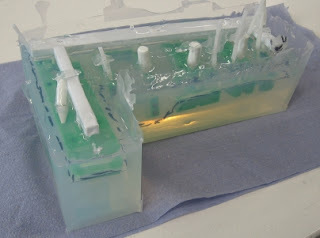 So we can make moulds and send them to people, who can then make kits for the RepRap store (or elsewhere). If you've followed along in the forums, you know that we have someone CNCing us 10 extruder kits from aluminum. They should be finished shortly, which is very exciting. 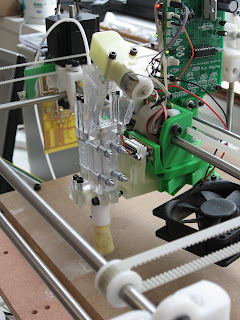 It will be a big step for the project as a whole to double the number of RepRap extruders that are 'in the wild'. 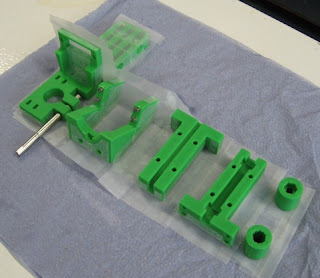 In the pictures here, I'm assembling a prototype of the extruder. The finished version will only be slightly different, if at all. This extruder feels very strong, and I think once we get these into the hands of some very capable reprappers, we will see some very good, and very exciting results come about. My MSc student Arman has modified his auto-head-changer (which always was for Mendel, not Darwin) to design and make a quick-change plug-unplug mechanism for the Darwin head. You have to take the head off quite often when you're setting up the machine, and also when you're using it. Before, that took about 15 minutes of fiddling with cap screws in hard-to-get-at places. Now it takes a couple of seconds. 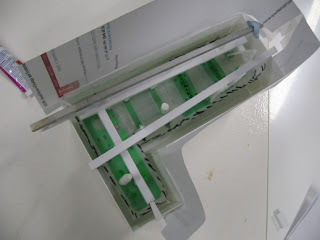 The next thing we'll do is to make two heads: one for CAPA and one for HDPE so we can swap them ad-lib for experiments. We'll also put the balloon paste extruder on the same mechanism next to this one for support experiments.